I first visited Toastmasters in August of 2017, having literally never given a speech or spoken in public throughout the whole of my adult life. It was something I wanted to try and change but I was never expecting it to happen so quickly. On my first visit to Croydon Communicators, i was asked (with no pressure) if I'd like to deliver a short table topic. I agreed, without being overly keen, then spent the next 20 minutes figuring out my best escape routes. I did do it though and it went really well. I can remember coming home afterwards on a real high, already feeling the confidence boost I'd been searching for. I joined pretty much immediately after that first visit. As it turned out, my first opportunity to give a full speech was in the Humorous Speaking Contest in September. It was doubtlessly the most terrifying build up to a single evening of my life. But again, it went fantastically well and I came away completely elated with having been able to get up there and have a go. I'm still only at the very start of what I know will be a long journey with Croydon Communicators and I still have so much to learn. But, if there's any place to learn, it's here. Everyone is so kind and welcoming and it creates such a supportive environment, in which you'll quickly feel completely safe to work on your public speaking skills. If you're thinking about starting the Toastmasters journey yourself, whether it be here with Croydon Communicators or another club, the best advice I can give is to stop thinking and just go for it. You'll be staggered by how quickly you realise what a fantastic decision you've made. 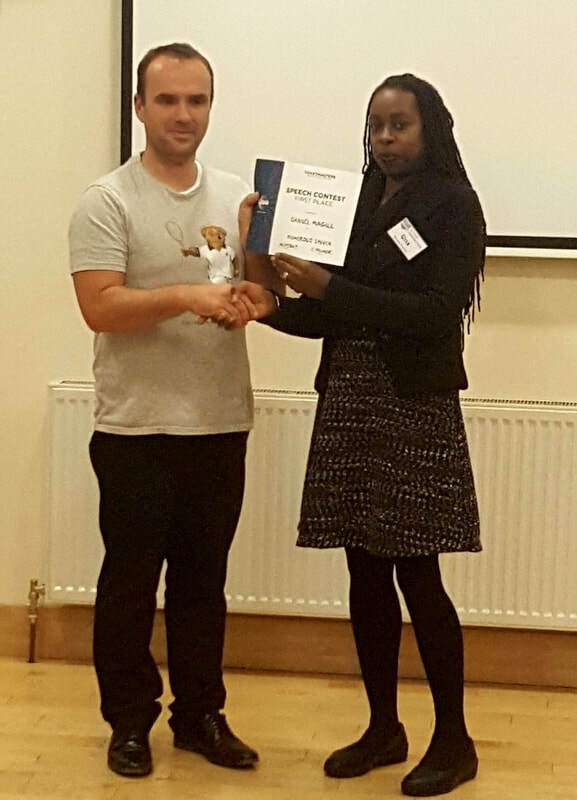 Dan pictured at the Croydon Communicators Humorous Speaking Contest 2017 - despite being new to the club, he managed the incredible achievement of scooping both Best Speaker and Best Table Topics awards! Here he is receiving his award from Club Immediate Past President, Gina. So if you are thinking about joining Toastmasters... Just go for it!